Palm Springs was wonderful until the mercury started to rise. By the time we hooked up and pulled out of town the average temp was around 106′ F. Too toasty for our bones. We made the trip back home to Spokane to spend the summer. Our house is a total oasis in the summertime. Our fun was sidelined for a month or so due to a 40 ft. cedar tree making a cozy home on top of our pool, deck and roof. Those summer wind storms are to be taken seriously. I was home when it hit and needless to say my friend Hannah and I were emotional basket cases the rest of the day. In September, Ryan headed down to stay in “man camp” in Southern Oregon. The job was outside of Coquille, OR and very remote. I stayed back until I finished up work on our annual luncheon and joined him the first week of October. Man camp was actually pretty amazing. (Aside from the 5+ mile drive to a clear cut to get cell service, driving 40 minutes to do laundry and filling up our tanks with a garden hose fed by a pump that I found myself kicking quite a lot.) It felt like an Indian Summer and most every night we sat fireside in the middle of a field and forgot there was any other type of way to live. We had to leave Man Camp once the rain started to fall. The down side of living in a field in the fall is that you are living in a field in the fall. We moved to Sutherlin, OR. for about a month before we headed to Pennsylvania for two weeks over Thanksgiving. From Pennsylvania we headed back home and in true Blinn fashion, we left for California the day we landed. We called Vacaville home for a few weeks before taking time off for Christmas. We spent the Holidays at my parents home in Fox Island, WA. and then spent time in Sunriver, OR. and boarded Mt.Bachelor until the New Year. After the first of the year we packed up and left Vacaville for Angels Camp, CA. And that is where I find myself now. We are about an hour and a half from Yosemite National Park and smack dab in the middle of Gold Country. 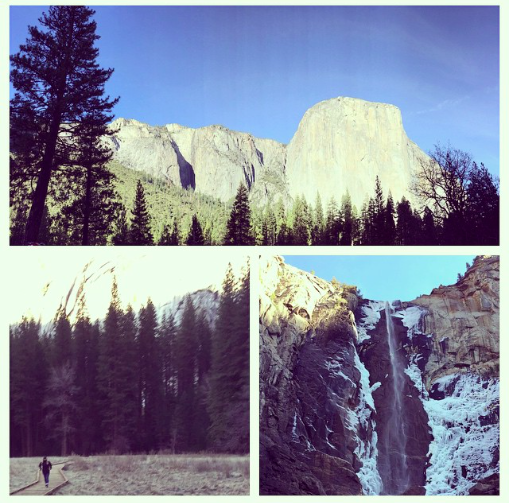 If you haven’t already been, make sure to put Yosemite on your list. El Capitan itself if worth the trip. There is plenty to explore in this area. Between the sprawling farm ground and rolling hills you find little towns rich with history. It’s hard not to get inspired by the way it once was. I find myself looking for black sand in the creeks I hike by just in case there is a nice little gold nugget with my name on it. A girl can dream. Previous PostI haven’t been everywhere, but it is on my list. Next PostMaking my first jump. There is an angel living at Angeles Camp. She’s gone mobile, but always in my heart.